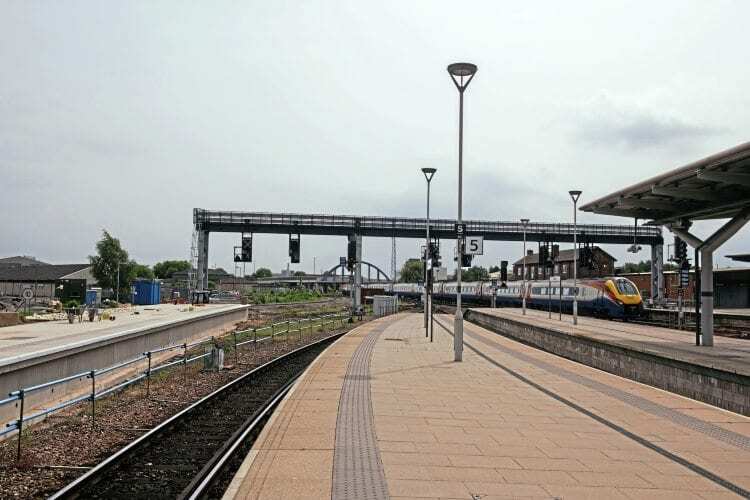 THE final piece of the electrification jigsaw of the Derbyshire area in general, and the Midland Main Line in particular, will see Derby station and its approaches controlled by the East Midlands Control Centre (EMCC) from mid-August, as track rationalisation and improvements works close Derby Power Signalbox (PSB). Resignalling work in the region has been progressing for several years, with the whole of the MML north of Bedford, routes west to Nuneaton, east to Newark, the traffic centres of Nottingham and Toton, as well as the Erewash Valley and the MML to just south of Sheffield, now entirely operated from the EMCC. A 79-day closure will upgrade the track layout through Derby station, which has changed little since 1969 when the PSB opened. Since the new year, there are just two lines approaching from the Birmingham direction, and with the removal of the redundant freight loops over the Christmas period, all traffic at the south end of the station is now channelled through one single bottleneck junction. The redesign of the layout separates not only long-distance and local traffic, but also segregates cross-country and freight, terminating or reversing trains, and London to Sheffield traffic, meaning conflicting moves are also eradicated.